Inclusive fitness and reciprocal altruism are widely thought to be distinct explanations for how altruism evolves. Here we show that they rely on the same underlying mechanism. We demonstrate this commonality by applying Hamilton’s rule, normally associated with inclusive fitness, to two simple models of reciprocal altruism: one, an iterated prisoner’s dilemma model with conditional behavior; the other, a mutualistic symbiosis model where two interacting species differ in conditional behaviors, fitness benefits, and costs. We employ Queller’s generalization of Hamilton’s rule because the traditional version of this rule does not apply when genotype and phenotype frequencies differ or when fitness effects are nonadditive, both of which are true in classic models of reciprocal altruism. Queller’s equation is more general in that it applies to all situations covered by earlier versions of Hamilton’s rule but also handles nonadditivity, conditional behavior, and lack of genetic similarity between altruists and recipients. Our results suggest changes to standard interpretations of Hamilton’s rule that focus on kinship and indirect fitness. Despite being more than 20 years old, Queller’s generalization of Hamilton’s rule is not sufficiently appreciated, especially its implications for the unification of the theories of inclusive fitness and reciprocal altruism. Fletcher, J.A., and Zwick, M., 2006. 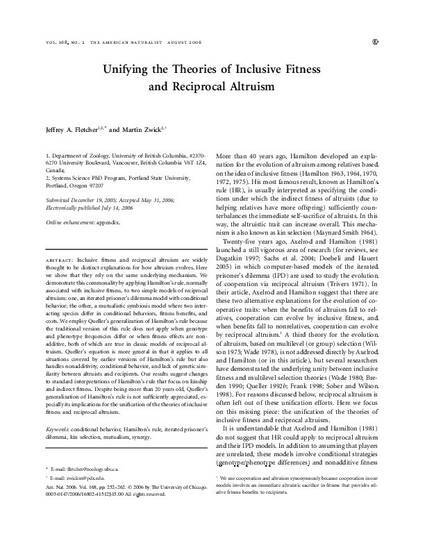 Unifying the Theories of Inclusive Fitness and Reciprocal Altruism. The American Naturalist 168: 252-262.